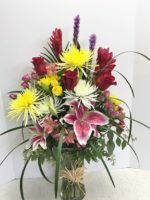 If you’re looking for a garden, where flowers look as through they’re growing from the ground with lots of greens, draped and tall, and assorted flowers and colors, then this arrangement is the one for you. 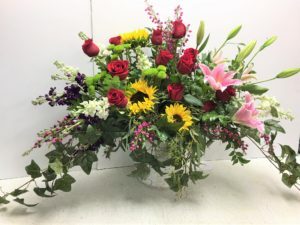 We’ll custom design the arrangement using flowers such as roses, sunflowers, stock, larkspur, charmelita, and lilies with assorted greens such as eucalyptus, tree fern, huckleberry and leather. The look will be similar to this one, but the garden will vary depending on the availability of the seasonal flowers. 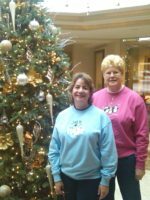 If you have a particular flower or color in mind, please call us at 602-246-1271 and let us discuss our Happy Garden arrangement that can be personalized just for you. Just like a garden, the flowers and color may vary. The sentiment will not. SKU: RR 3014 Categories: $150 and above, Celebrations of Life, Congratulations, Corporate: Fresh Flowers, Funeral, Funeral: Bouquets & Floral Baskets, Funeral: Celebrations of Life, Funeral: For the Service, Housewarming, Thank You Tags: a, Florist, Flowers, Garden, Garden Flowers, Phoenix, Phoenix Flower Shop, Tina's Flowers, Where is Tina? 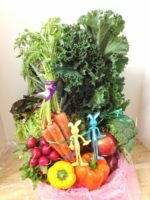 This beautiful Happy Garden is a tremendous, large garden-style floral basket custom designed by Roadrunner Florist! Many people don’t have any idea which flowers are appropriate for a funeral service, a Celebration of Life, or a housewarming party. Our Happy Garden floral arrangement is the perfect idea for any of those. Just like the garden, the flowers and color may vary. The sentiment will not. You might prefer our Timeless Elegance Bouquet or Nature’s Garden.